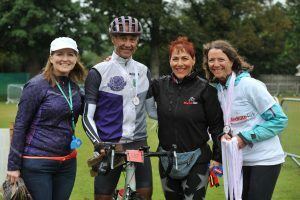 The Marlow Red Kite Ride sportive took place on Sunday 3 September 2017, and attracted a record number of entries including cycling enthusiast and former pop star Andrew Ridgeley. After a fine start to the day which was perfect cycling weather, almost 700 riders enjoyed the all new 50, 80 and 100 mile routes and crossed the finishing line with big smiles, despite the soggy end to the day. Listed by Cycling Weekly as one of the top ten sportives near London, this is the sixth year of our popular event which attracted entrants from as far a field as Newcastle and Cornwall. The provisional results are now available here: Marlow Red Kite 2017 Results We will publish final results in a week, when we hope to add back the club names. If you have any questions or comments please let us know. Coin Lavis, Event Director for the Marlow Red Kite Ride added, “In a market where there are now a lot of different sportives to choose from, we are delighted that once again the Red Kite Ride was completely sold out in advance. We’d like to thank everyone that took part including loyal participants that come year after year, and those joining us for the first time. One of the nominated charities for 2017 is Marlow Sports Club (MSC) where Marlow Riders is based. MSC is a registered charity that provides the opportunity to take part in sport to over 2,000 people every week. To secure the future of this valuable sporting facility for the people of Marlow, the club is looking to expand and upgrade its amenities, providing additional space for more sports and including wheel chair access and better changing facilities. Saved from redevelopment only a few short years ago, a donation from the Red Kite Ride will make a significant contribution to safeguarding local sport for all, and to help build a cycling community in Marlow for generations to come.